The Helmeted Guinea Fowl is a bird considered unusual for several good reasons. Firstly, it is a very alert bird and makes a loud, distinct call for almost any other noise that it perceives nearby. This behavior led to it being used for protection purposes. 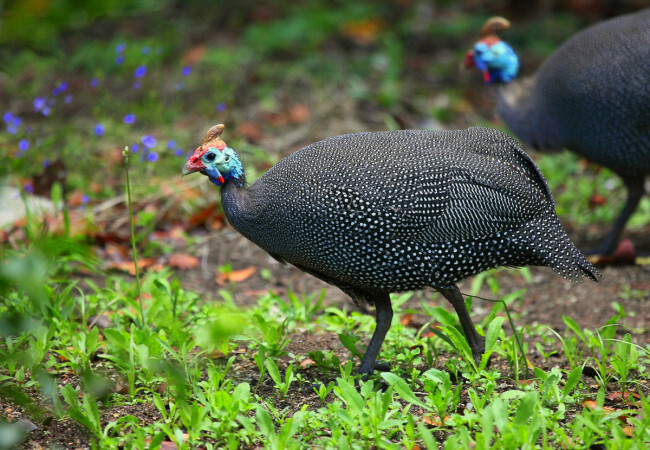 The Helmeted Guinea Fowl is extremely fond of insects, so it is better not to keep this bird around the house if you have any plans with bees or other types of insects for that matter. They often stand and watch every move, in or out, around beehives, planning to attack. 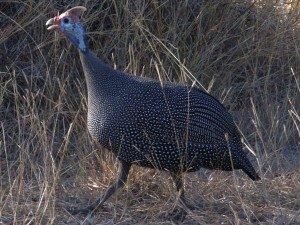 The Helmeted Guinea Fowl proved to be an efficient tool in the control of deer ticks, which are the transportation means for the Lyme disease. The ideal environment for the Guinea Fowl is the open space, while indoors and pens proved to be more like poor choices. If there are chickens as well in the same yard, this may be a bad combination, as male Guinea Fowl are aggressive with the male chickens and will chase them away from food and water. However, they can also get along with other bird species, provided there is enough space for them. 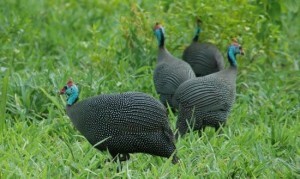 As opposed to the males, the Guinea Fowl females are more relaxed in the presence of other birds. 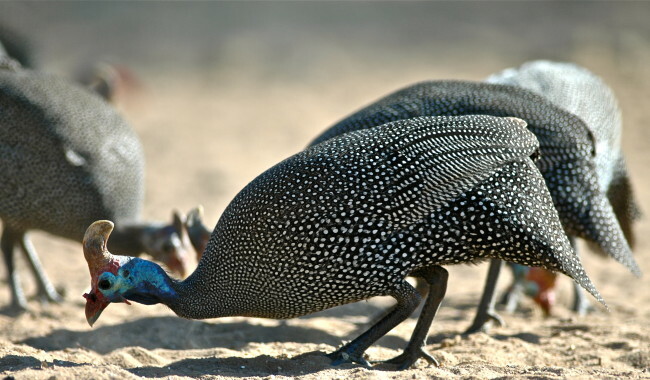 In general, Helmeted Guinea Fowl are suitable for dry areas, as they are well adapted for this environment. Weighing no more than around 1.5 kilos, the Helmeted Guinea Fowl can be considered a small bird. It is a bit disproportionate when putting in balance a rather big quantity of meat and the small bone structure of this bird. When it comes to appearance, three different types can be differentiated, based on the plumage pattern and colors and these are the Partial, the Solid and the Pearled. A network of white dots covers the plumage of the Pearled Guinea Fowl variety, while solid color is the only one present on the Solid variety, no other marking or spot, as the meaning of the name itself implies. The third variety, the Partial, acts as a bridge between the other two varieties, combining the dotted chest and back with the solid colored rest of the plumage. Additional to the three varieties mentioned, there are several others which include Royal Purple, Chocolate, Buff Dundotte, Lavender, Porcelain and Coral Blue Guinea. 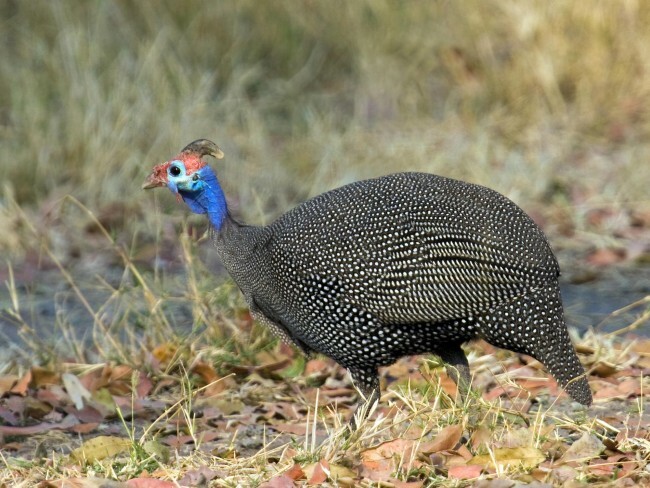 It is a bit difficult to distinguish a male Guinea Fowl from a female, as there are no very obvious differences. However, the easiest way is by looking at the facial characteristics, as the male’s helmets and wattles are a bit larger than the female’s. In addition to this, the call of the bird can help identify if it’s a female or a male. While both have a single syllable call, the female has an extra two syllables call which sounds similar to the word ‘buckwheat’. West Africa is the origins of this breed and nowadays this bird’s meat is served as a delicacy in restaurants, as well as their eggs. 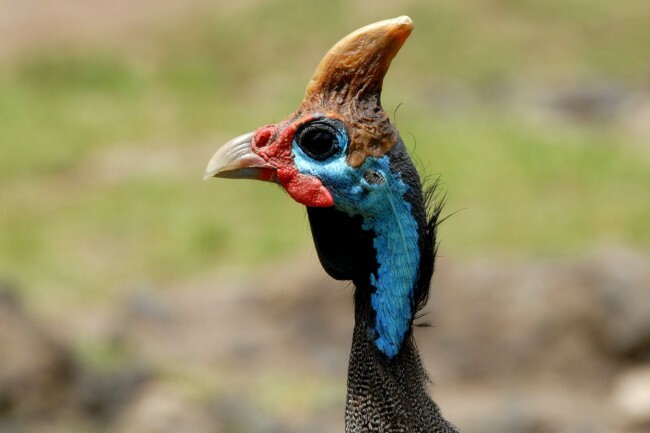 As mentioned above, it is ideal for the Helmeted Guinea Fowl to live in open spaces instead of closed pens, but it is also true that birds from this breed that were recently acquired is best to be kept in such enclosures until they manage to adapt to their new habitat. Only later on, they can be freed so they can roam at will. It is important to proceed as such, because if they wander right away they may get lost and fail to understand where they should be. These birds mate for life. 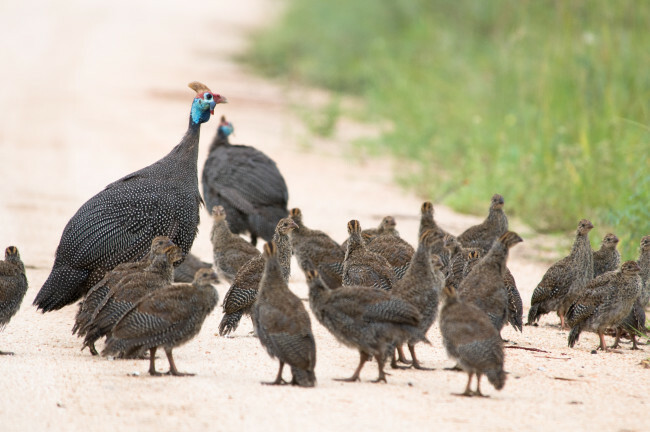 The egg laying season for the Helmeted Guinea Fowl is usually in April or May and the place they choose is usually a field, where up to 60 eggs can be laid at once. These small, dark colored eggs will incubate for up to four weeks. After they hatch, the chicks are important to be kept dry, as getting wet lowers the chances of survival. A bit reluctant at first, they get more towards the domestic side after a couple of weeks.